The LTLLT23/BF reel trucks are very strong and heavy duty. The popular heavy duty LTLLT23/BF Reel Handling Pallet Truck can be made with angled forks suitable for handling rolls and reels. 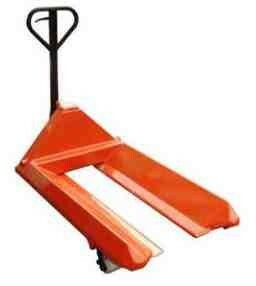 With the use of inside flaps we can offer a single pallet truck suitable for very wide ranges of reel diameters. When enquiring please state reel diameter(s) and length of reel/roll. Notes: Can be manufactured for reels up to 2300mm in dia.